In recent years, float fishing along Steelhead Alley has taken off. Many of the streams found along Lake Erie are tailored made for it. The majority of streams are often slow flowing mixed with sections of riffles and runs. Because the streams tend to run low and clear, steelhead will seek out the deeper holes and pools. Fishing these areas with a fly rod is challenging if not impossible. 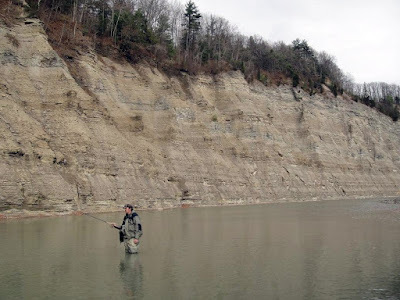 Steelhead Alley has a unique fishery because the streams are so different from other areas found around the Great Lakes. Because of the low and clear conditions. Many anglers have resorted to longer rods, light lines, and small presentations. The average float fishing steelheader uses rods ranging from 10’1/2 long all the way up to 15’1/2 long. The reason for using such long rods is because the majority of streams tend to run low and clear. Due to the clear conditions, line control is important as it helps to keep as much line off of the water as possible. The less line on the water, the less drag there is. It’s easier to manipulate the float and drift into the target area without spooking fish. The Longer rods also absorb a lot of energy from a fighting fish. There's been plenty of times that I've landed large fish on 6-pound test. My rod of choice is the 13' G Loomis GLX. It's the perfect rod for the Great Lakes steelheader. The rod is light and well balanced however, it’s very expensive costing $595. There’s plenty of entry-level rods out there made by Raven, Temple Fork, Shimano, Okuma, and Daiwa. Many float fishermen today use a centerpin over a spinning reel. The biggest advantage a centerpin has over a spinning reel is its ability to free spool. By free spooling, the line comes off the reel effortlessly. This allows the angler to better control the float and presentation. Also, the line is taut and the result is very quick hook sets. Unlike spinning reels, a centerpin is much more expensive. Low-end models made by Raven and Okuma start at $200.00 and some of the top end models such as Kingpin, Milner, JKW Young and go for over $600.00. It’s a difficult reel to master, but once learned you'll never go back to a spinning reel. Line selection is very important when certain conditions come into play such as water clarity and time of year. When using a float set-up, the line is broken down into 3 segments - mainline, leader and tippet. For the mainline, I like to use a strong abrasion resistant monofilament. Over the years, I have used a variety of lines such as Trilene, Sunline, and Suffix and the best so far has been Blood Run, which is specifically made for float fishing. The line is strong, not as stiff in cold conditions and mends well. For the mainline, I would suggest using a 15-pound test. When it comes to snags you want the tippet to break off instead of losing your entire rig. For the leader and tippet, I strictly use fluorocarbon. Fluorocarbon is more abrasion resistant and because the streams generally run low and clear. Plus the bottom is often littered with rocks and other debris. On the leader is where I place my sinkers. Attaching the tippet to the leader I use a micro swivel. For a leader I’ll use either 10 or 8-pound test. The tippet I generally use 6-pound test. With longer rods, there’s no need to go heavy. I’ve caught plenty of large fish on light lines. When it comes to floats, I pretty well use nothing but Raven’s FM floats. They’re versatile working in every type of water. The smallest I’ll go with is 4.2 grams up to 5.5 grams when fishing a large river. For the tubing, all Raven floats use the 3/32" silicone tubing on the top and 1/16" tubing on the bottom. Split shots are what make your presentation look natural to a fish. On the water surface the current might look fast, but on the bottom, it’s much slower. This is due to objects on the stream bottom such as rocks or other debris. As the water hits these objects it slows the current down. This is why steelhead prefers to hold on the bottom. When placing shots on a leader, the heaviest shots should be placed on the top and progressively use smaller ones as you go down the leader. I usually never place a shot on the tippet, but there has been debate whether it affects the presentation. The reason for this is as I mentioned before the current is slower on the bottom. By doing so, the fish will see the presentation first and it looks more natural as there is no drag. For the majority of fishing, I like to space my shots evenly along the leader. But, some water conditions call for different shot patterns. When the water is fast and shallow, I’ll stack most of the shots high up and leave one or two at the bottom. If a section is fast and very deep and short, I’ll drop all of the shots to the bottom to get my presentation down fast. The best hooks for steelhead are ones that have a wide gap and are of a thin profile. Hooks should be of high strength and stay sharp. Some of my favorite hooks are Owner SSW and Kamasan B983. I tend to prefer size 8 hooks for sacs or shiners. For beads, I’ll use size 10 hooks. The majority of anglers either use sacs or jigs. Shiners can be difficult to get during the winter and transporting them can be a hassle. I primarily use sacs and when conditions are clear I’ll go to a jig or a bead. Float fishing is a great alternative to those who hate the complexity of fly fishing. I find it to be one of the most productive ways to fish for steelhead.